You can’t have a wedding without having cake! Today as wedding cakes become more outlandish and unusual, we look how the wedding cake tradition began. The tradition of a wedding cake goes back to Roman times when a cake of meal was crumbled over the bride’s head to provide good luck for their marriage. Roman wedding cakes were made by baking a mixture of wheat or barley (symbols of prosperity and fertility) and salt into small cakes – rather like large bread rolls. In Medieval England, cakes were stacked as high as possible for the bride and groom to kiss over. A successful kiss meant they were guaranteed a prosperous life together. Traditionally the bride would place a ring inside the couple’s portion of the cake to symbolise acceptance of the proposal. During the mid-17th century to the beginning of the 19th, the cake was served at most weddings. Guests were expected to have a piece out of politeness. It was considered very rude and bad luck not to eat the bride’s pie. Fruit cakes were a sign of fertility and prosperity, which helped them gain popularity because married men wanted to have plenty of children. The bride’s cake eventually transformed into the modern wedding cake we know today. 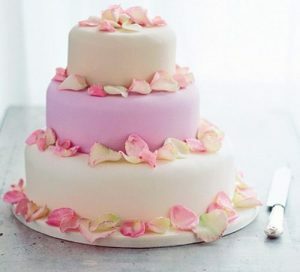 In the 17th century, two cakes were made, one for the bride and one for the groom. The groom’s cake eventually died out and the bride’s cake turned into the main cake for the event. The groom’s cake was usually darker and richer than the bride’s. Queen Victoria started the trend for the big, white wedding (in her choice of attire and cake). Previously, icing and frosting had been expensive and so, were reserved for solely rich and wealthy families. But from the 1840s onwards sugar and icing were more accessible and so, less wealthy families began to imitate the weddings of the rich. This show of wealth and status has continued into the present day (and is often evident in the cake). Princess Diana’s cake was an impressive five tiers whilst the Beckham’s cut their four-tiered cake with a sword! The cutting of the cake is a task full of symbolism. The cake was originally intended to be distributed among the guests by only the bride because consuming the cake would ensure fertility. As weddings grew and the number of guests increased this task became a joint venture, the groom needed to help cut the growing cake and distribute it among their guests. In the 18th century, newlywed couples would try to keep the cake until their first anniversary to prevent them from marriage problems in the future. This is one of the reasons why cakes in the 18th century were made of fruits and blended with wine, to ensure their longevity. Nowadays you’re lucky if there’s anything but crumbs left after the wedding day!